Fancy being locked in a room with your friends for 60 minutes? Countdown Challenge is the latest addition to Dubai’es escape room games, with 4 different escape games to play – Last Will, Stolen, Crime Evidence & Escape Plan. Up for a fun challenge? The only way out is by solving puzzles and finding clues, so get your thinking caps on and… good luck! 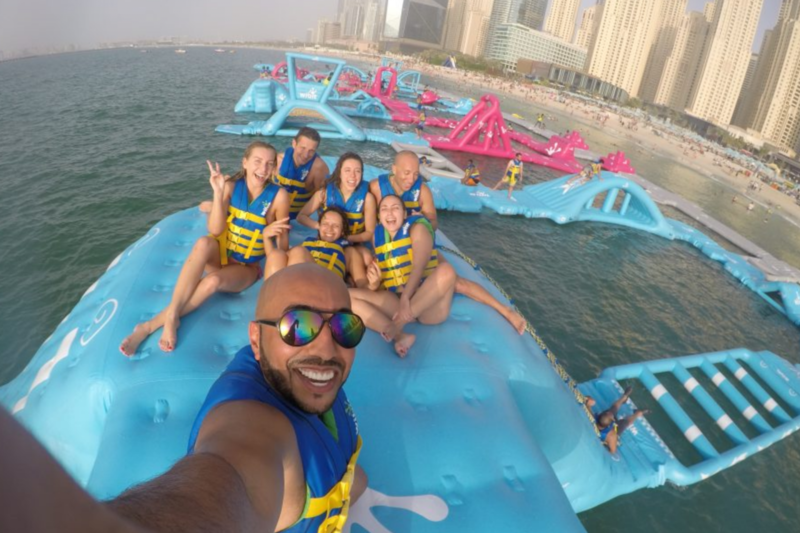 Yep, there’s a floating obstacle course at JBR beach and it’s in the shape of the Dubai logo! AquaFun is the world’s largest outdoor water park and it’s a super fun way to beat the summer heat. Think you’ve got what it takes to complete it? So did we, but this inflatable course is not as easy as it looks! Trust us, you will fall off… multiple times! If you’re looking for fun team challenge to take on, you need to try out TEPFactor! You’ll need to group up into teams and solve a variety of crazy challenges at TEPFactor! There are four different categories, and you’ll have to complete them all to unlock the secret levels, and finally find the treasure. Up for some old school arcade games? Stereo Arcade is a super cool place to hang out, play Street Fighter, listen to some awesome live music and hit the club after!